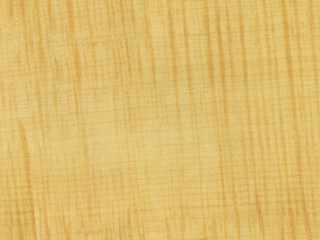 Granata Guitars are unmatched in tone and playability. 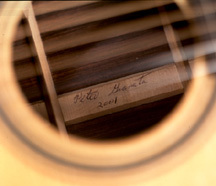 Hand built in a humidity controlled environment, the bodies are made from only the finest tone woods available. 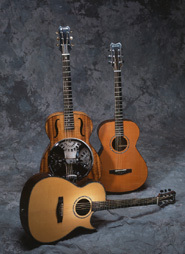 The wood bindings and high gloss finish exemplify the care and craftsmanship that go into each and every instrument. 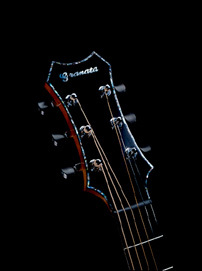 The five piece laminated necks add strength and stability through a multitude of tuning configurations. The neck is joined to the body with a dovetail joint. Each neck is hand carved so "special request" neck shapes are no problem. The headstock is scarf jointed to remove short grain. This in turn eliminates headstock cracks. Most instruments include chrome Gotoh tuners with ebony knobs unless others are requested. 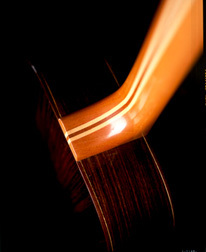 The individually carved necks also allow for any nut width and string spacing required. 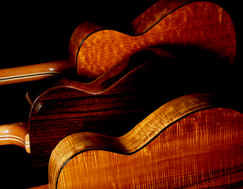 The ebony fingerboards insure that your Granata Guitar will be playing well indefinitely. The custom features are limitless on these handmade instruments. Pick up systems are installed at the clients request. Custom designs and inlays are also available.